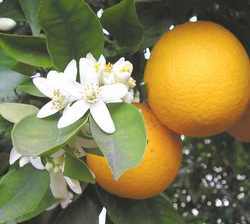 Common Name : Bigarade Orange, Bitter Orange, Seville Orange (sweet), Portugal Orange, Citrus Dulcis. Uses : Bitter orange is antiseptic, anti-oxidant, antispasmodic, aromatic, astringent, carminative, digestive, sedative, stimulant, stomachic and tonic. It is rich in Vitamin C, flavonoids and volatile oil. It is appetite suppressant, metabolism and energy booster. Tea prepared from fruit is used to relive headache. Fruit is used in constipation, dyspepsia and indigestion. Fruit peel powder is used in face pack against sunstroke and skin blemishes. It is also used to dissolve kidney stones. It purifies blood and improves immunity. The seed and the pericarp are used in the treatment of anorexia, chest pains, colds, coughs etc. "Bitter orange oil", expressed from the peel, is in demand for flavoring candy, ice cream, baked goods, gelatins and puddings, chewing gum, soft drinks, liqueurs and pharmaceutical products.